It is time to get hiiiigh. The wonders of this area are striking from any angle, but perhaps they are best viewed from above. Choose from four different excursions, each one more impressive than the last, and take in this incredible landscape from the best seat in the house! Enjoy some expert commentary from the pilot as you tour this world-class destination from high above the ground. 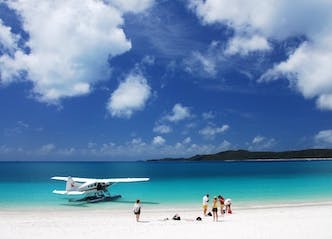 The Whitsundays, the Great Barrier Reef, Whitehaven Beach, Heart Reef…the list of incredible sights in this area goes on and on. Choose your target, and climb aboard. 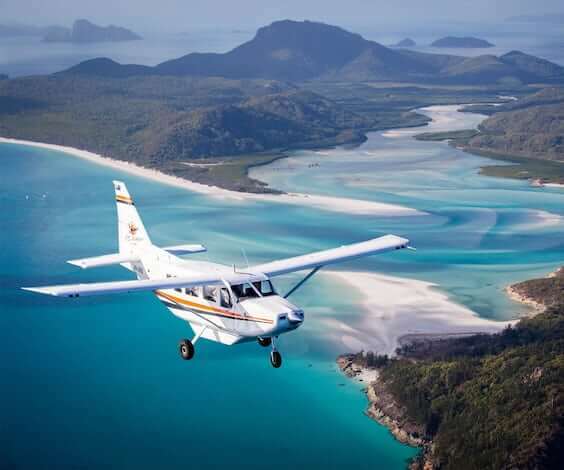 As your experienced pilot guns the engine, you get to enjoy the uniqueness of a small aircraft taking to the air, and the beauty and grandeur of this coastline. A world-class destination befits a good viewpoint, and you are getting the best one possible! Is your Buck a nervous flyer? Perhaps a little bit scared of heights? Now is the time to help him to conquer his fears – or document them! The feeling of a light aircraft is completely different to that of a larger commuter jet. Get a feeling for it – you might like it. Have you flown in a helicopter before? This unique machine will turn some heads as you cruise overhead! Crank ‘Fortunate Son’ and pretend you are headed for that hot LZ! The scenery. This is the real appeal. The area around Airlie Beach provides some of the best views going, so bring your camera along and take some instagrammable shots for your family and followers to enjoy. Once you have put your feet back on terra firma, it is time to celebrate this experience with a night on the town. Not a bad look, as Airlie Beach brings a mean party! With so many attractions, the area around Airlie Beach could keep your Bucks party occupied for a long, long time. That is the appeal of a destination like this one – you can choose a series of activities that suit you, and your Buck, perfectly. But you’ll need to narrow it down mate – time is fleeting, and you only have a few days to work with here. So what is on the docket for this party? Outdoorsy stuff? The pub? Some friendly competition? Airlie Beach Deep Sea Fishing Trip: The blue ocean, stretching away to the horizon, plays host to a wide variety of game fish. And we have found a charter skipper that can put you on top of them! Hop on board and feel that rod buckle! Airlie Beach Skydiving: Hey, once your Buck jumps out of a plane, walking down the aisle will be a breeze. Airlie Beach Rum tasting: Where there is sugarcane, there is more than likely some enterprising individual who is using this beautiful stuff to make some tasty rum, and Airlie Beach is no exception. Taste the freshest stuff out there, and learn how it is made and how it pairs with food on this activity! Airlie Beach Stand Up Paddleboarding: Keen to slow the pace down a bit and get some sun? This activity lets you tour the waterfront, get a bit of a workout, and soak up some sun. The perfect mellow starter to a day of fun. Airlie Beach Sailing Trip: The trade winds of the Whitsundays provide a first-rate spot to hoist some sail, and your excursion boat is a true thoroughbred – an ex-racer – and it is ready to show you how to cruise in style! A Bucks party in Airlie Beach puts you in position to enjoy the party of a lifetime – as befits an occasion like this one! Contact one of our friendly party planners, and let’s put the pieces together!